About a week ago, Joanie the pit bull was discovered carrying an injured little friend -- Chachi the Chihuahua -- inside her mouth, around a Savannah, Georgia, neighborhood. Animal control officers found Joanie putting Chachi down from time to time, to lick the Chihuahua's badly infected eye. Chachi "appreciated the attention," according the Savannah-Chatham Metropolitan Police Department's Facebook post on the pair. "It's not every day we get to see such devotion between two special dogs like this," Animal Control Officer Christina Sutherin is quoted as saying. "They are both such sweet animals. But the relationship they share just sets them apart." Shelter veterinarians had to remove Chachi's bum eye, and so Joanie has been living separately from her companion while he convalesces -- though Sutherin tells HuffPost that the two still "get together-time daily." "Staff is amazed at the dedication and love these two have for one another," says Sutherin. At first, police expected Joanie and Chachi's owner to come forward; since no one has yet claimed the pair, the new hope is that the pups will be adopted together, into a family with lots of love -- but maybe without any other dogs. "Neither one seems to care about another dog they are exposed to, only each other," says Sutherin. "They truly appear to be soul mates." UPDATE: July 23, 10:15 p.m. -- Joanie the pit bull and Chachi the Chihuahua "are going to have Happy Days in Florida!," in the words of the Savannah-Chatham Metropolitan Police Department. 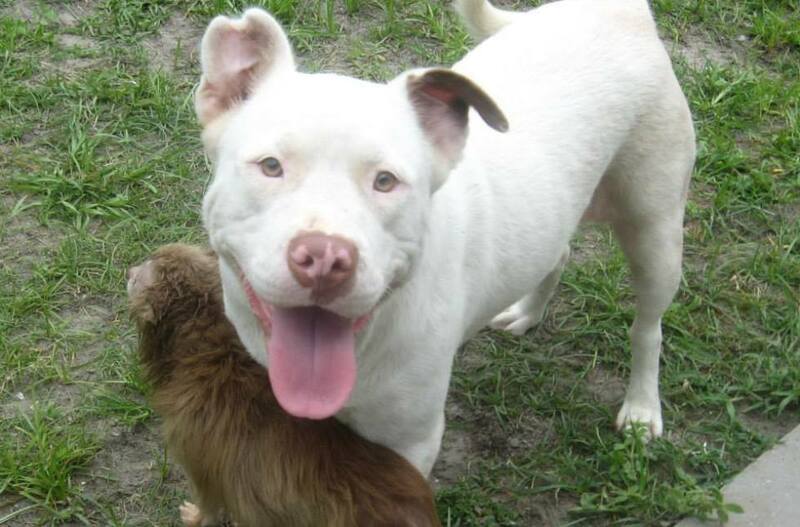 Someone -- the name hasn't been released -- from the Sunshine State is adopting this special pair. The move is likely sometime in August. Adopt These Special Needs Animals! This is Bon Jovi. He is a deaf Dogo Argentino who is just 13 weeks old. Find out more about this smarty pants from <a href="https://www.facebook.com/GreenDogsUnleashed" target="_blank">Green Dogs Unleashed</a>.